I hope you can have some answer in this documentation , if not can you provide concerned screenshot configuration page and any elements to better understand situation ? Last edit: 2 years 2 months ago by Philip. I have the same error at a website that is been updated from hikashop 2.6.4. Newly installed sites with fresh Hikashop 3.0.0 do not have these messages. When you select ALL at the Order settings in the Dashboard the message is "Table has no columns." 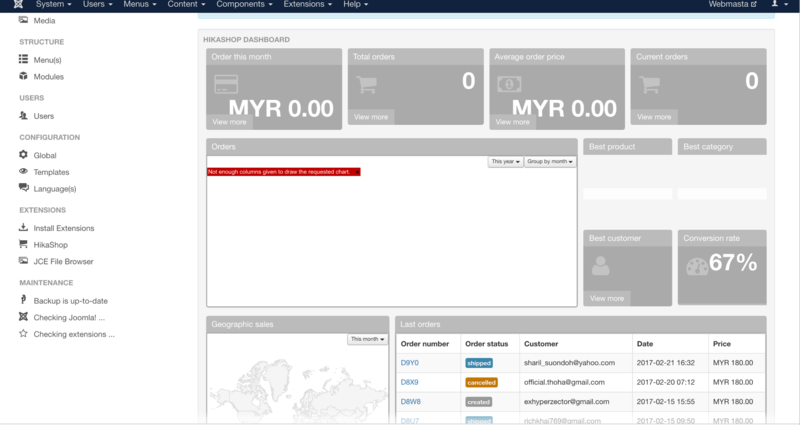 Could you do a screenshot of the dashboard in the HikaShop dashboard screen so that we can compare what you have ? There are several orders but they are not there at the dashboard. The reports are all default. No change has been made ever. What table needs to be there ? Does your orders have "invoice number" ? The dashboard is based on the information "order_invoice_created" which is the date when the order has been confirmed for the first time. If you do not have invoice number, you do not have that date either and it means that the stats system do not find any order. Nicolas added the setting "stats_valid_order_statuses" in the columns available in the backend order status listing. So you should now be able to select which order statuses are use for the stats. If you put the "created" status in that list, the system will base his search on "order_created" instead of "order_invoice_created". I was following this thread since I have the same issue (also update ftom 2.64. to 3.0.0). You can create any report you want in Orders/Reports. the all come up with a nice table, list or graph. Only in the Dashboard nothing changes. The message "not enough collumns" remains and the other stats still display zero. Just tested it with the latest build 1702251124. What parameter(s) do I have to change additionally to see something in the dashboard. For the new dashboard, please read and follow the instruction in my previous message. If you want to display the legacy reports, please modify your HIkaShop configuration to use the legacy dashboard. I want to see stats in the dashboard.... i do not want to use the legacy dashboard. No i am using the new dashboard but see no stats. What do i have to change in the configuration to see stats in the new dashboard ? No the stats are being displayed in the new dashboard and this topic can be closed. oh my, i still dont understand where to to add stats_valid_order_statuses. which column? You'll only see it if you have the "dashboard legacy" setting turned off in the HikaShop configuration and that you have a recent enough build of HikaShop 3.0.0. So check that setting and download again the install package on our website and install it on yours to get the patch to get that column. We just fixed that, so you should be able to get the patch now. Hai, i already install the Latest 3.0.1 but as you can see in the image attachment there is no data for total order, average order, best product, best customer, best category and geographical sale. For order, it still show Not enough columns given to draw the requested chart. it only show the conversion rate and last order data. How to make it display the data? As we said earlier, you need to make sure that the "statistics" settings in the menu System>Order statuses correspond to what you want to display. So if your orders are created and not confirmed, you want to activate "created" there. If your orders are confirmed, you want to activate "confirmed" there. Etc.